Why not turn your car into high impact advertising? It’s easy with our vinyl lettering or digital printed car signs. Watch people read your message where ever you go. We offer a wide range of products and have a perfect solution whatever you project is. And by the way, we can also print on backlit film and/or clear vinyl and attach it to your acrylic, if you already have a light box. Minuteman Press Frankston signage products and services, cater to pretty much any and every signage situation and requirement you have. We can do a poster, pull-up banner, A-Frames, car signage, window graphics, heat transfers, right through to outdoor banners or PVC prints cut to shape. We are the design and print experts. We have the in-house expertise to take care of all of your signage requirements. From design and print, to print your design, on anything from one-off event signage to permanent outdoor banners and displays. Our signage not only looks great, but it stands the test of time against the elements. Effective signage has been designed to suit its application and purpose, providing clear and easy to read calls to action and contact details. We can help create with design. We’re the print professionals and can print on to pretty much any surface you can think of. Signage solutions for indoor and outdoor applications. From design and print, to providing the stand and/or mechanism to help you get your signage standing up (A-Frames, eyelets and rope) we can help. Minuteman Press Frankston provide a range of signage solutions and are pleased to offer free quotes for all of your needs. Ph 9773 5586. Signage is a fundamental part of marketing. All businesses have signage, even if it’s just your name on the building exterior. Signage can be used in a range of places and applications, from roadside billboards to footpath signs, fence signs and car signage. From an indoor perspective, signage can be used to provide your customers with information (menu board) and directions (get tickets here), or to promote sales and specific products and services. 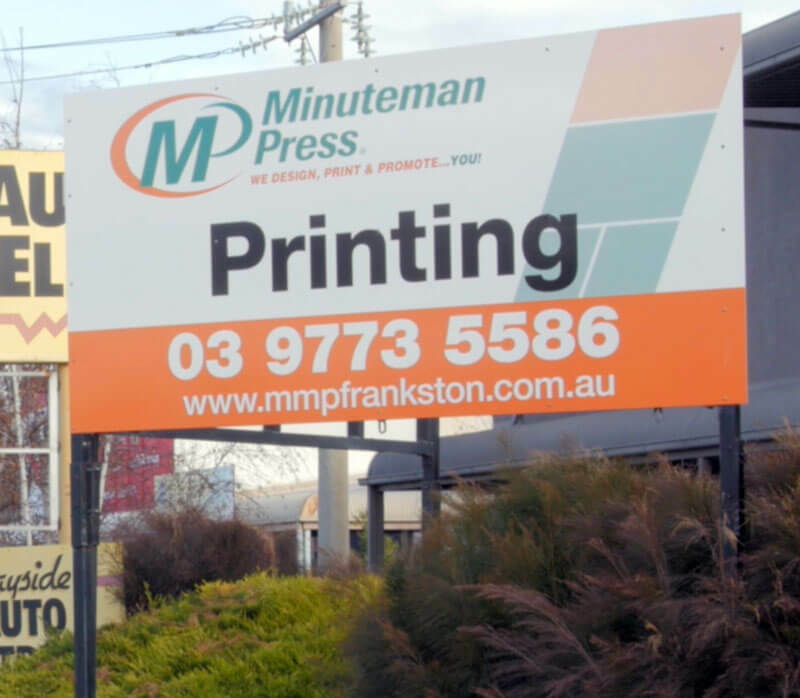 Minuteman Press Frankston signage services are customised to suit your needs. From design and print to print your design, indoor and outdoor applications. For more information, or to request an obligation free quote, contact us today on 9773 5586 or sales@mmpfrankston.com.au We’re open Monday to Friday, 8.30am till 5pm.